Despite the blood in the halls of Westminster, UK Prime Minister Theresa May could yet triumph as she battles a dismal array of naysayers within her own party, and Labour opportunists without. Here's how she could confound them all. Even as the arrows rain down, she can still unleash three terrors to sway doubters. These are: No deal. No Brexit. Or the prospect of No Tory government. The spectre these conjure up has the potential to freeze Brexiteers into a corner. Bombast and ambition currently blinds them to the realities of the ultimate weakness of their position. The simplistic solutions to the complex uncoupling required to depart the EU are delusional and unattainable. They're behaving like an indignant golfer, storming out of the club yet still expecting the same tee-times, no green fees, and full access to the bar facilities. The utopian Global Britain Free-Trade Promised Land deal, touted by Brexiteers, is a mirage. But the 47pc of the EU trade they do is very real and it is being put in jeopardy. Mrs May has little option but to lash herself to the mast and hope she can weather the storm, mutiny, or both. She must stare them straight in the eye and face down "the bastards", as John Major once described them. Her fate hinges on fixing the final headcount. She also needs to wage and win a PR war and make sure any waverers know they are facing a career in the wilderness. Successful heaves pivot on a consensus about the likely victor. And if nothing else, Mrs May is blessed in her enemies, having seen off David Davis, Boris Johnson, and Dominic Raab, who went last week. Michael Gove, Andrea Leadsom and Liam Fox all lacked the bottle when it came to it. Meanwhile, Jacob Rees-Moggs's European Research Group has been unable to muster the requisite number of letters required to pull the lever on the trap-door. Whatever else, Mrs May is still the least worst option for the Conservatives and the UK. 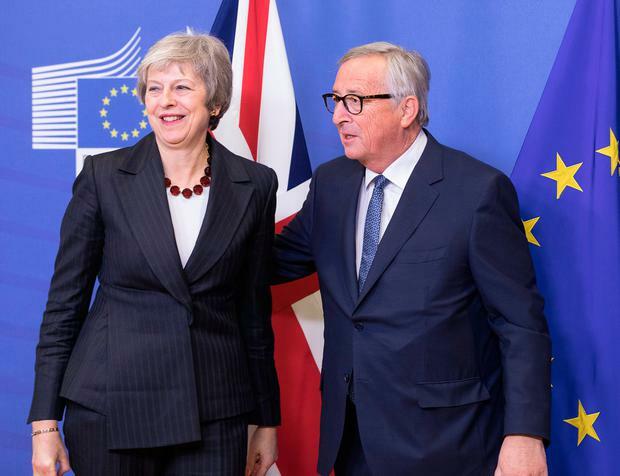 She hardly helped her cause with the hollow mantra, "No deal is better than a bad deal". In truth, a no-deal crash-out next March 29 is entirely impossible. The consequences are too dire. Take just one sector - aviation. "Common travel" only provides for surface transport. Last year, 16 airlines operating in the UK carried 151 million passengers. Air travel is based on "airspace sovereignty", originally set out in the first article of the 1944 Chicago Convention stating "every state has complete and exclusive sovereignty over airspace above its territory". Outside your own jurisdiction, you can't fly an aircraft without another government's permission. This is regulated by inter-government services agreements (ASAs). Our aviation originated with an Irish-UK 1946 ASA. Ireland's 29 bilateral ASAs were handled under the UN's civil aviation agency ICAO - separate to WTO rules. Layers of additional regulation include safety validation of aviation personnel, equipment air-worthiness, airport safety, air operations, air traffic management and navigation services. Every facet of airline activity is currently overseen by the EU aviation safety agency (EASA). This is heavy stuff; you don't change it on a whim or to suit a political mood shift. There are no prospects of the UK organising its own bilateral replacements by March 30. Airlines are regulated on the basis of the ownership structure of more than 50pc of its shareholders. Many British airlines aren't majority-owned by Britons. Under the Chicago principles, this will prove very problematic for UK transatlantic routes. The EU regime regulates all passenger rights where flights are disrupted, delayed or cancelled. A no-deal Brexit will ground UK flights. It's that simple or that stark. Brexit is incompatible with European blue skies policy and practice. The future regulatory reform programmes like air traffic control, which is grossly inefficient within the EU with too many ATC providers and zero competition, will exclude Britain. Fifty years of painstaking work can't be substituted in less than 130 days. Grounded British planes/passengers mean a slam-dunk disaster of people paralysis. Small wonder arguments for a "people's vote" are gaining ground. But currently they only serve to complicate the craziness. Any referendum has to be a binary choice - not a multiple-choice "preferendum". The surest way for a second referendum to scupper Brexit is for the Brits to experience the isolation arising from the total chaos that will be unleashed across trade in goods and services. The time to go back to the people is after the transition period, implementation period and ultimate bespoke EU/UK final trade agreement is known. Only then, whether in or out, will the terms be visible. The longer period between that poll and the original egregious error of June 2016, the more likely a reversal is beyond 2022. This is based on Leave voters finally accepting the core problem with Brexit is Brexit. More youthful voters will mobilise, diluting the impact of older pro-Brexit cohorts. The greater the delay, the easier it is for many to admit they got it wrong first time around. But a second referendum only works with the right result. There is the inevitability of a FTSE stock market crash and sterling crisis if the British government has to inform Westminster on January 21 that there's no alternative to a WTO whiplash exit. If Mrs May's withdrawal agreement is rejected by parliament on December 14, repeat votes on the divorce deal will be embraced in face of the enormity of 'no deal'. The barking dog, yet to bite in this fight, is British business. A vassal state is better than a jobless, bankrupt Britain. Brexit-in-name-only is better than no Brexit. The magic figure of 318 MPs will emerge across the Commons. While political leaders of an entire continent were convulsed to create Northern Ireland's unique sweet spot, neither the DUP dodos nor Sinn Féin absentees participated in constructive solutions on behalf of their voters. For Unionists to hitch their wagon to English nationalism is an incalculable error. Ireland (only a pimple on EU's backside) can sit tight, with the "backstop" in our back pocket. The unparalleled diplomatic/political success of harnessing unanimity amongst 27 EU states to protect our tiny peripheral state is without precedent. Unpicking the Withdrawal Treaty text isn't an option after tomorrow's EU summit ratification. The endgame is clear - checkmate against a hard Brexit.